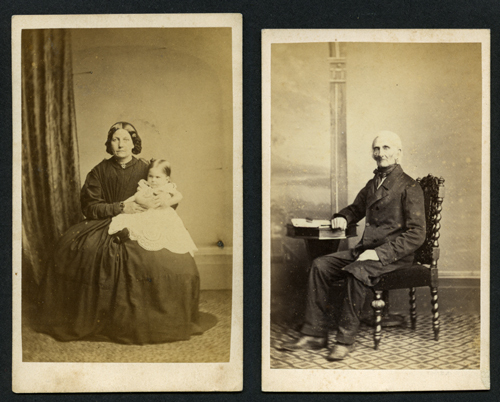 Subjects, styles, advertising, other relevant information: In his early years Edward Johnson worked as a boot closer and in 1851 was working as such, living with his wife Ann (b:1825 Wisbech), at Little South Street Wisbech. In 1861 he was at 8 Ryan Street Wisbech working as both a photographer and a boot closer, with his wife and son Ernest E. (b:1859). By 1865 Edward's reputation as a photographer was growing. The Cambridge Independent Press of 17 June 1865 reported: Views of Wisbech. 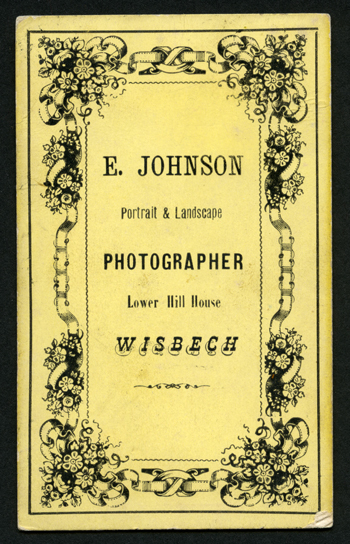 Our respected townsman Mr E Johnson photographic artist is now publishing some very beautiful carte views of Wisbech which far excel anything of the kind we have previously seen". In 1871 Edward was a photographer at 23 Lower Hill Place Wisbech, his son Valentine E (b:1868) lived with him and his wife. In 1881 he had diversified somewhat, was still at 23 Lower Hill Place, and his occupation was "photographer and fancy repository". 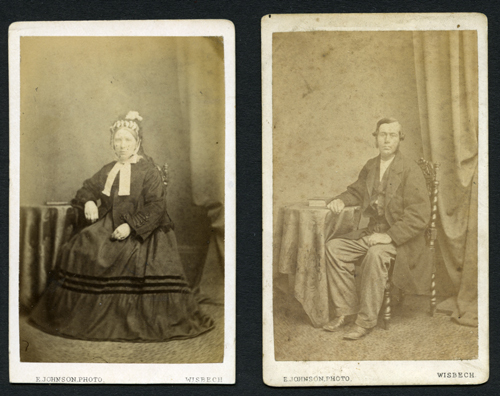 Living with him and his wife was his son Valentine E (b:1868), a visitor who was an apprentice photographer, Florence Buck (b:1868 Wisbech), two domestic servants and two widowed lodgers. 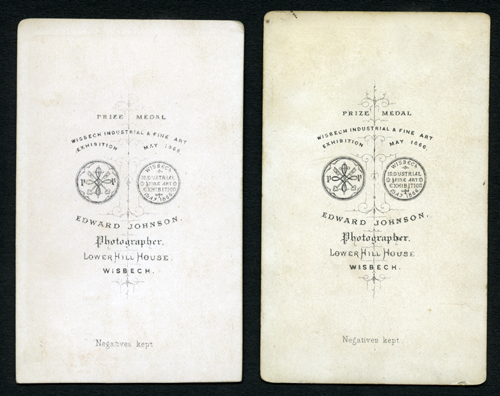 In 1891 Edward was still a photographer at the same address. Edward's wife Ann was running the fancy business, son Valentine had become a private tutor and author. 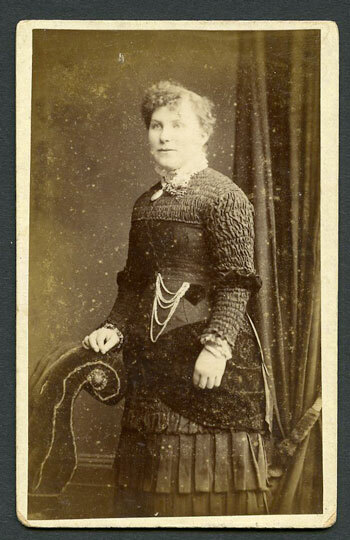 Hattie Bray (b:Wisbech 1881) lived in as a shop assistant for the fancy business. The family employed a housemaid and a cook. In 1901 Edward had become a retired photographer and was living at 16 Great Church Street Wisbech. 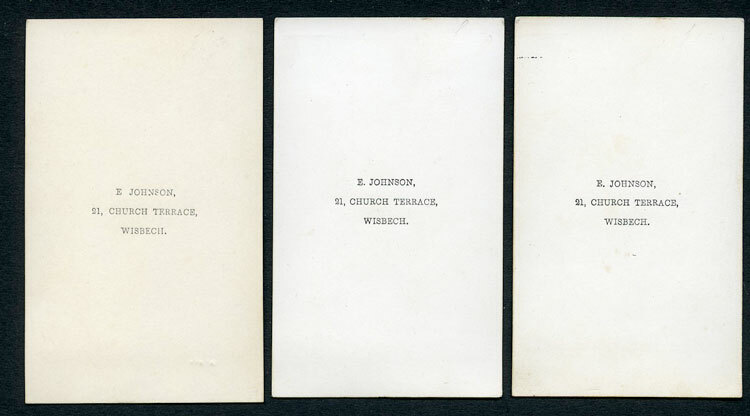 Edward's photographs of local churches were published in three volumes by Leach and Son Wisbech. See below for examples of Edward's cartes de visite from the author's collection. 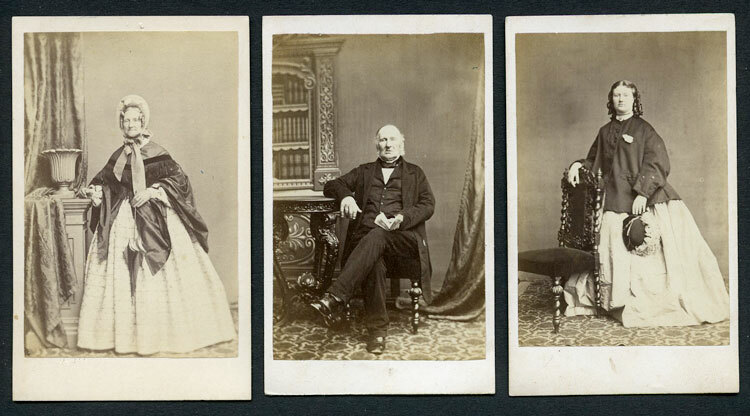 The first three shown are probably the earliest, the images are from the 1860s, the square cornered cream card mounts have no information on the face and on the reverse the photographer's details are in three rows of print. The first image of an unknown lady in a bonnet is mounted on a mount from a different batch to the negt two - the first one being on cream cardstock a couple of millimeters wider than the next two. Also close examination of the typefaces shows that the type on the wider mount has been printed on a press where the pressure is set lower than was the case with the next two. There is no way of knowing which of these two batches of mounts came first. 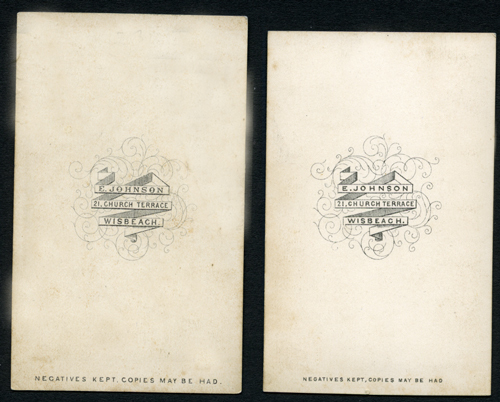 The second pair of cartes de visite have no text on the front of the mounts, on the rear is written "E Johnson 21 Church Terrace, Wisbeach" (sic) the two mounts are different sizes and printed with a different typeface. The larger mount is 4 and 1/8 inches x 2 and 1/2 inches, the smaller 4 x 2 and 1/4 inches, both have square corners and, from the address and style of clothing, these appear to date from the mid 1860s. 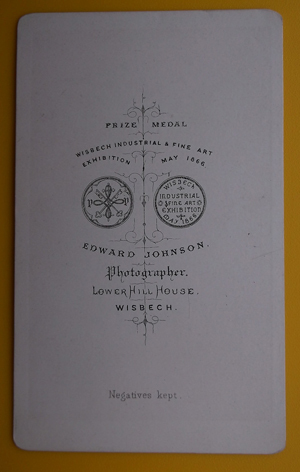 The next pair of cartes de visite appear slightly later and the reverse states "Prize Medal, Wisbech Industrial and Fine Art Exhibition May 1866 Edward Johnson, Photographer Lower Hill House, Wisbech, negatives kept". 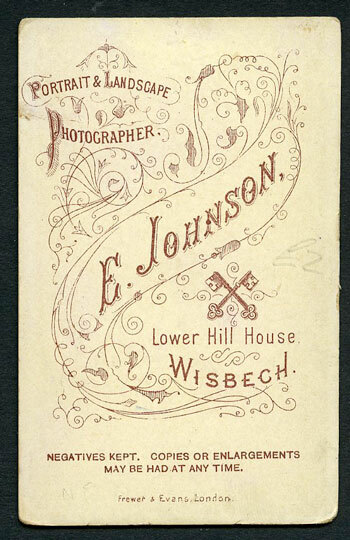 On the face the mounts have text "E Johnson Photo Wisbech". These obviously were produced in or after 1866. The left hand carte has probably had a couple of millimeters trimmed off the bottom to fit it into an album. 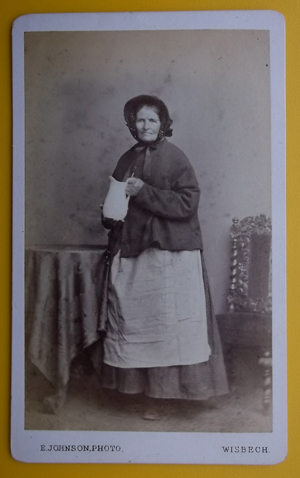 Below these is another post 1866 carte de visite from Simon Shirley's collection of a middle aged woman in every-day clothes including bonnet, apron and holding a jug - an obvious attempt by Johnson to show the sitter in the context of her normal life or work. 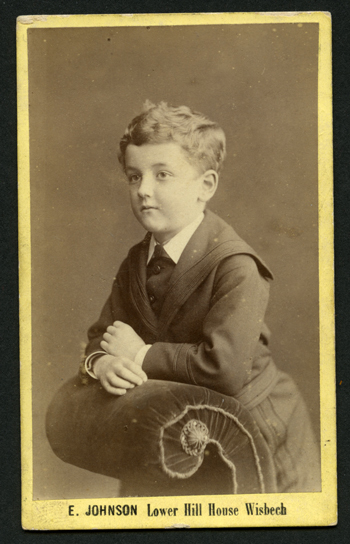 Next is a carte de visite portrait of a curly-haired young boy, probably from the 1880s. The mount is cream with square corners. On the face of the mount is written "E.Johnson Lower Hill House Wisbech". The reverse of the mount has an elaborate floral border and the text reads" E Johnson portrait and landscape photographer Lower Hill House Wisbech" . Next is a carte de visite on a mount produced by Frewer and Evans, London, with rounded corners and fancy scrollwork on the reverse. Interestingly the image features the same scroll ended prop as the previous carte. This example is probably from the 1880s. Kelly's Directories of Cambridgeshire 1864-92: 21 Church Terrace, Wisbech 1864 and 23 Lower Hill St, Wisbech 1869, 1875, 1879, 1883, 1888 and 1892. JOHNSON, Harry and Nephew, Cambridge, Booksellers and Stationers, 3 St Andrews Street Cambridge. Agency for a walking pictures Sunfilms business in Cambridge in the 1930s. See our page on Walking Pictures in Cambridgeshire for more details. The level of involvement of the firm in the business is not currently known. Subjects, styles, advertising, other relevant information: Postcard producer from Hastings, where he took over a business in 1902. Frederick traveled extensively taking photographs for his postcards – including Cambridge and Cambridgeshire subjects. Working Dates: c. 1990 – at least 2000. A number of online directories suggest the business is still operating in 2016. Working Dates: 1889 - ? Subjects, styles, advertising, other relevant information: George Langham Julyan Jun was born in Peterborough in 1873, son of George L Julyan, an outfitter. In 1901 George and his wife Emily Julyan (née Furnis b: Peterborough 1877) were living at 17 Cromwell Road, Peterborough. George was then employed as an outfitter's assistant. In 1911 the family were in the same house, with a 5 year old son, Frank Furnis Julyan. George was then a self employed bicycle mechanic working on his own account. 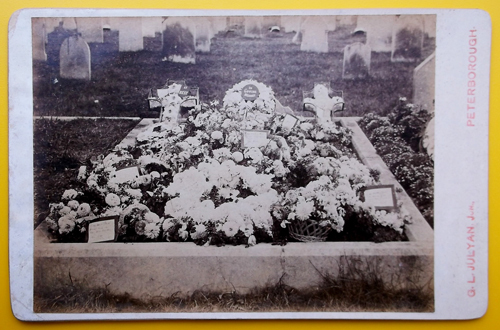 The cabinet photograph below (Simon Shirley Collection) of a grave, has the photographer's name on the face, "GL Julyan Jun Peterborough" and the reverse is blank. However, in manuscript on the reverse is written "Annie Julyan's grave in Peterborough Cemetery". Annie Lavinia Julyan, b:1877 was George's sister, who died in 1889. References: Census returns 1881, 1901, 1911. No trace has been found of George as a photographer in any of the Peterborough trade directories.